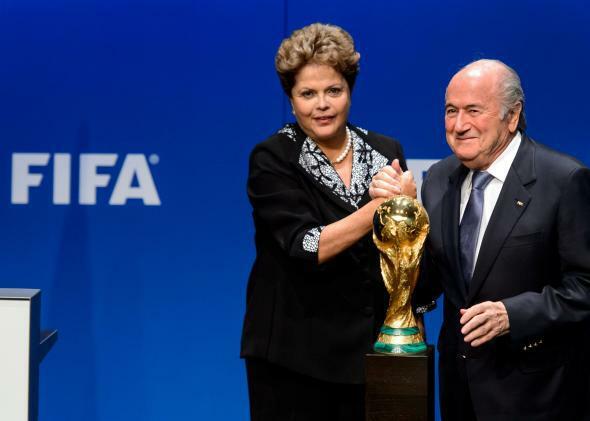 Brazil blown out by Germany at World Cup: How will it effect President Dilma Rousseff in the upcoming election? Aside from Germany fans, it’s hard to imagine anyone really enjoying the spontaneous combustion of Brazil’s national soccer team in Belo Horizonte today. But I imagine that watching the 7–1 defeat to Germany was particularly painful for the country’s embattled president, Dilma Rousseff. Perhaps appropriately for the football-mad nation, Brazilian election years coincide with the World Cup. Fernando Henrique Cardoso has claimed that the euphoria surrounding the country’s 1994 World Cup victory contributed to the success of the economic liberalization program he was in the process of rolling out as finance minister and his election as president later that year. The effect isn’t that robust—the 2002 World Cup victory didn’t save Cardoso’s chosen successor from being ousted by leftist challenger Luiz Inácio Lula da Silva—but you’d have to imagine that today’s scoreline will have at least some impact on the country’s upcoming election. Lula and Rousseff likely imagined six years ago that the good vibes surrounding this tournament would propel them to victory. It hasn’t worked out that way. With widespread anger over inflation, public corruption, and the cost of the event, a majority of Brazilians opposed the World Cup. While the focus on the massive street protests against the event has faded, they have still been happening. Rousseff hasn’t been attending the home team’s games following the verbal abuse she received from fans at the opening match against Croatia. On the other hand, there were signs that the country’s mood was improving, as were Rousseff’s poll numbers. If Brazil had won the tournament, it could have changed the political significance of the entire event. If the country had made a dignified exit in the late rounds, it probably wouldn’t have had that much of an impact either way. But a defeat this humiliating is going to remind a lot of voters of why they were upset about the World Cup in the first place. Anti-Dilma chants were reportedly already being heard at the stadium today. I don’t think he had on-field events in mind, and the actual hosting of the World Cup has gone fairly smoothly so far considering some of the dire pretournament predictions. *Correction, July 8, 2014: This post originally misspelled the last name of German soccer player André Schürrle.